Activity toys are one of the best toys you can get for your children. However, outdoor climbing toys are extremely limited when it comes to things like the weather and night time. But what if there was a way you could safely bring the physical and engaging activity of an outdoor jungle gym into your house for your children to enjoy any time of the day or night? Fortunately, there is. Thanks to modern-day developments, you and your children can enjoy a fully-featured jungle gym, right in the comfort of your own home. That means your children will be able to run and play off their excess energy before bed in a safe and entertaining way. Many parents won’t have even heard of indoor climbing gyms, and I don’t blame them. 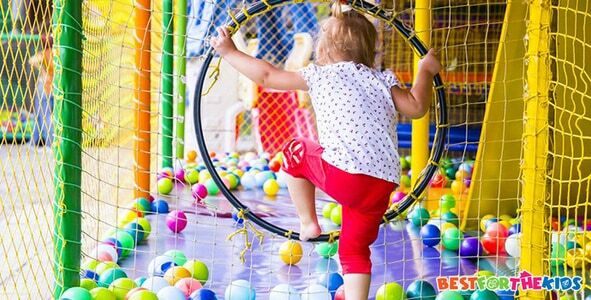 Here to give you a helping hand, I’ve narrowed down the search to five of the most entertaining indoor gyms that you and your children will love. This is my absolute favorite climbing sets for toddlers, and it’s one that my children love. With this set, you’ll find so many activities that your children won’t know what to do with themselves next. The most obvious feature is the climb-and-slide. This means, in the comfort of your their playroom, your children can enjoy an exhilarating slide which they’ll want to go on again and again and again. 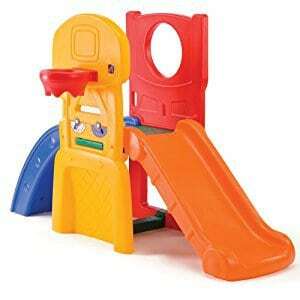 Your kids will be able to explore the underneath of the slide where there’s a dedicated crawl space. This is perfect for hiding in, and it makes the ideal hide-and-seek spot. At least you’ll know where to look when it comes to bedtime and your children are nowhere to be found. One of the more interesting features of this climbing set is the ball contraption stuck to the side. Here, your children will be able to drop balls down from the top. This can be done either from the top of the slide platform or with your toddlers standing on the ground. What's Great About It: What’s the point of having a ball maze and ball pit if you don’t have any balls? Thankfully, Step2 include ten balls with their set, giving you everything you need to get started. There are more balls available for replacements or extra balls if you need them. EZPlay is one of the leading children’s play toys and they always deliver high-quality products that are loved by parents and children alike. This Koala themed indoor playground is no exception. 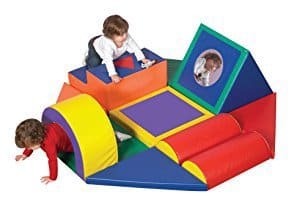 This durable playground can be set up anywhere in your house, and you can easily fold it away if you need the space. This means your children can always enjoy this playground in any room in the house. Within the playground, your children will be able to explore a range of fun-filled activities that will keep them entertained for hours. This includes a climbing rope wall, a tall slide, a rope ladder, gymnasium hoops and a built-in swing. ​This all means that your children can stay active whether it’s raining or shining. Despite having an impressive list of features, all aspects of the kit are easy to fold up and store away as well as putting up during installation. That’s playtime in no time. What's Great About It: From this list of features, one of my first thoughts was ‘children hanging from the jungle gym? Surely it’s going to break?’ Fortunately, that’s not a problem. The playground itself is made from durable and safely-treated wood materials, designed for use by children up to the age of ten. If you’re looking for something a little smaller that’s still packed with features, feast your eyes on this amazing floor playground. This awesome set is designed with all your children in mind. In fact, it’s even baby safety approved. Your toddlers are free to explore three easy-to-setup tents that they can call their bases, no matter what games they’re playing. All these bases part of this playhouse are connected via travel tunnels, all made from breathable mesh materials to maintain a constant temperature. If your children want to invade another base stealthily, all tents are also accessible from the side, so they can sneak in. In addition to the tents, there’s also a ball pit, complete with a mini basketball hoop for more fun and excitement. ​If your children get bored of playing with the basketball hoop, each tent comes with its own selection of holes and targets, perfect for practicing hand-eye coordination. What's Great About It: With this tent, the question is what’s not great about it. Every piece of this set has been made from safety approved materials, all in accordance with USA CPSC Toy Safety Guidelines, and is so durable that it can be used both inside and outside the house, making it ideal for any type of playtime. 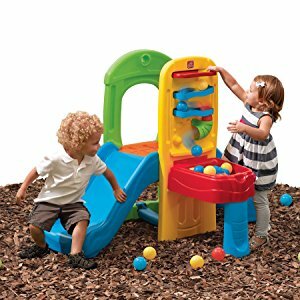 If you’re looking for a simpler playground that’s easy to set up and will keep your younger children entertained for hours on end, here’s a jungle gym that I instantly fell in love with. This self-proposed jungle gym is relatively simple at first glance, looking like variously shaped foam blocks that fit together nicely. However, there’s a world of fun and excitement to be had. With this set, there are tunnels, platforms, mirrors, steep hills, soft surfaces, hard surfaces, you name it, this floor set has probably got. 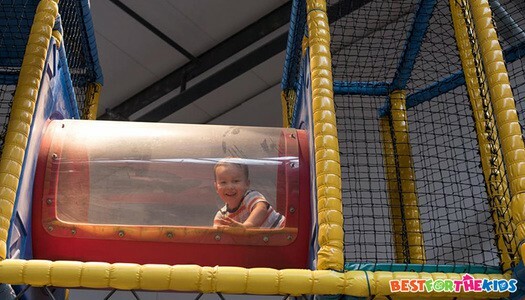 This is ideal for children who are too young for the bigger sets, but still want to enjoy the same level of excitement. What's Great About It: In addition to the two-year warranty, this set is perfect for any type of play. Whether your toddlers are playing or relaxing and listening to you read, there’s room to do it all. 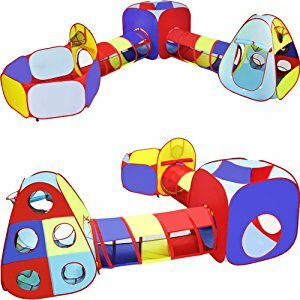 If your toddlers are looking for an insanely addictive jungle gym that they won’t be able to stop playing with, check out this awesome Sports Climber by Step2. For your budding athletes, there’s a fully-functional slide, complete with steps and safety side rails. But don’t worry, the ladder has been designed especially for tiny hands and feet and is as safe as possible. What's Great About It: One of the best features of this set that my kids absolutely loved was the large basketball hoop attached to the side. Whether you’re using little balls, mini footballs or basketballs, or even ball-pit balls, your children can enjoy a good old-fashioned game of hoops, no matter the weather is like outside. Indoor climbing toy? Interior jungle gym? These are definitely not words that we heard in our parenting classes, but it’s essential that we know them. Whether you’re shopping around or seeing if this is the right toy for you, here are a handful of benefits that you and your child can enjoy. The weather is not always perfect for outdoor play. We know this all too well. However, a bit of rain doesn’t mean that your children are going to have any less energy. By having an indoor climbing toy, your children will be able to relieve their energy levels whilst enjoying themselves, all from the comfort of their own home. With so many of us owning tablets, smartphones, and televisions, it’s easy for our children to get caught up in the habit of simply sitting in front of digital devices all day every day. However, when our children are young, their bodies are still developing and growing, which is why it’s so important for them to exercise. There are several cognitive benefits that indoor jungle gyms provide. Firstly, and most importantly, is spatial awareness. If your toddler is climbing up a ladder, this may seem simple to use, but for children, this is a big step towards improving their spatial awareness, which is a huge developmental step forward. There’s also their basic motor skills, simply by crawling, climbing, moving and running around the gym. The final benefit is social awareness. If your child has to share their gym with other children, they will have to learn patience and how to wait their turn. As much as we all recommend that children play outside for a bit of fresh air and sun, it’s unfortunately impossible to have this all the time. However, an indoor gym makes it incredibly easy to give your children all the benefits they would have had outside, reducing the risk of them falling into bad TV habits.